Therefore, on the big day, I did a couple of things that I hadn't done in years: I hosted a screening and printed a zine! 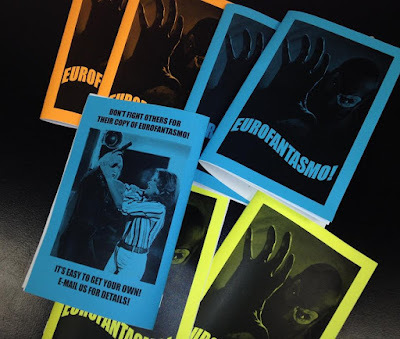 One overcast Sunday afternoon, the very first issue of Eurofantasmo! made its official, though inconspicuous, debut at the screening. Eurofantasmo! chronicles the rich history of Europe's genre cinema circa late 1950s to 1990; each issue tackles a different subgenre or topic. The debut issue focuses on superhero or super-criminal movies made in Italy during the 1960s. These twelve digest-sized pulse-pounding pages review eleven such films, including Danger Diabolik, both Kriminal films, Satanik, and both Superargo movies. While still toiling away at the new, revamped ESR (which has already been pushed back twice), I had the idea to do this little zine. Consider it the side dish to the main course still in progress. This project nonetheless provides an outlet for my lifelong fascination with and exploration of European genre film (and I still feel I'm scratching the surface). I felt it was a necessary diversion to preparing the new ESR. It also proved to be a pleasant throwback to the old days: thinking about design, proofreading, stapling and collating. And considering after three months, I have yet to receive any feedback on it, yep, it really is like the old days. (Granted, I'm behind in mailing out some copies to people who wanted a mag but couldn't attend the screening.) I still have some if you're interested! The next issue will likely go to print next month. Oh, and what was the screening? I showed the Stephen Boyd-Sylva Koscina caper film, The Manipulator. Whatever I can do to spread the word on this quirky delight. "Flo"? As in: the "Alice" spin-off series? You are a fine gentleman of decadent pursuits! One and the same, good sir! Thanks for the post!